Fall is my absolute favorite season, I love the cool crisp air, colorful changing leaves, and the smell of apple cider! 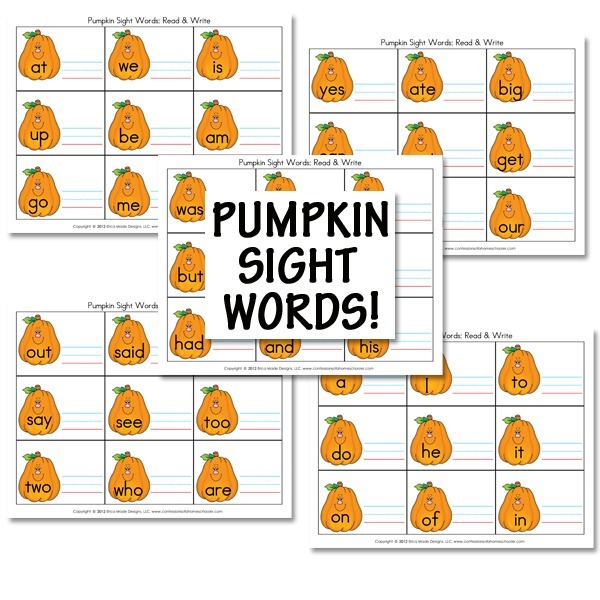 And with all that goodness, I just couldn’t resist creating some cute Pumpkin Sight Word practice cards for Tinker Bell! I wanted some cards that would help her read her words, but also give her a chance to write them as well. These cards also go well with my K4 Kindergarten Curriculum! To use, simply print the cards on cardstock or copy paper, then laminate or put sheet in a page protector. Have your student read the word, then practice writing it with a dry-erase marker! We prefer to use Expo Dry-Erase markers for this type of work. Hope you enjoy the pumpkin sight word printables! Thanks so much for these!! I made some for my son a while back and don’t ask me how you lose sight word cards, but I DID!! I was in need of a replacement so thank you so much for taking the time to make these! I started following you a few months ago and you have been such a great resource for me. We just started homeschooling this year! Praising God that I came across your website! Thanks for taking the time to help others. These are so cute! Thank you for sharing them. I’m going to add them to ED’s workbox today! Thank you for these and all your other cute free printables! I appreciate you taking the time to make these and graciously sharing them! Erica, I love these sight word printables. What a great idea to combine writing! In teaching two of my children to read, I found blending to be one of the toughest skills for them. With help from their grandma, who taught reading recovery in schools for years, I created a lesson on blending. I hope it helps your followers who are teaching their children to read. Too cute! I’ll be using these, thank you!